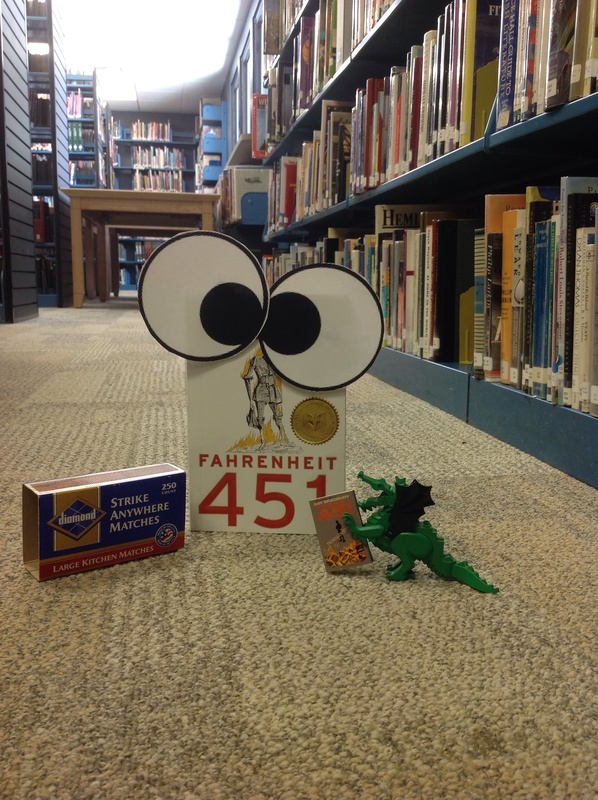 Oh, my word, is that our Dragonzilla friend and Fahrenheit 451 playing with matches? Looks like Dragonzilla is just being cheeky. We used up those matches for a birthday party before we left for the summer. Oh, Fahrenheit 451, you love irony, don’t you? 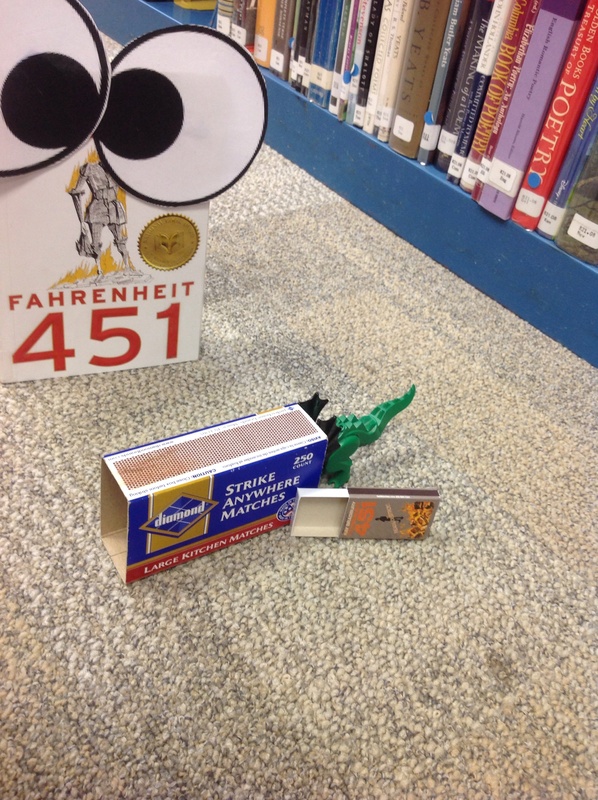 *No books (or dragons) were harmed in the making of this post. Don’t try this at home, kids, but do read Fahrenheit 451 (a classic) so you get the dark humor of this post. 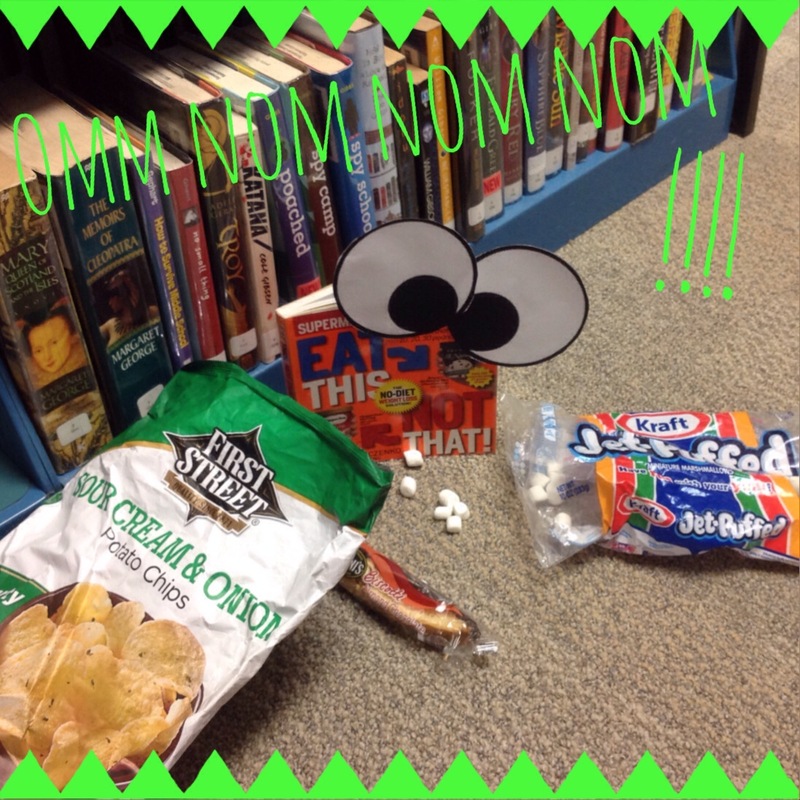 Eating in the library!? BUSTED! What was this little guy thinking? Obviously he isn’t aware of his online presence…we see what you’re doing, Mr. 613.2! It seems that, like us, the books are staying up past their regularly-scheduled, school-night bedtimes. 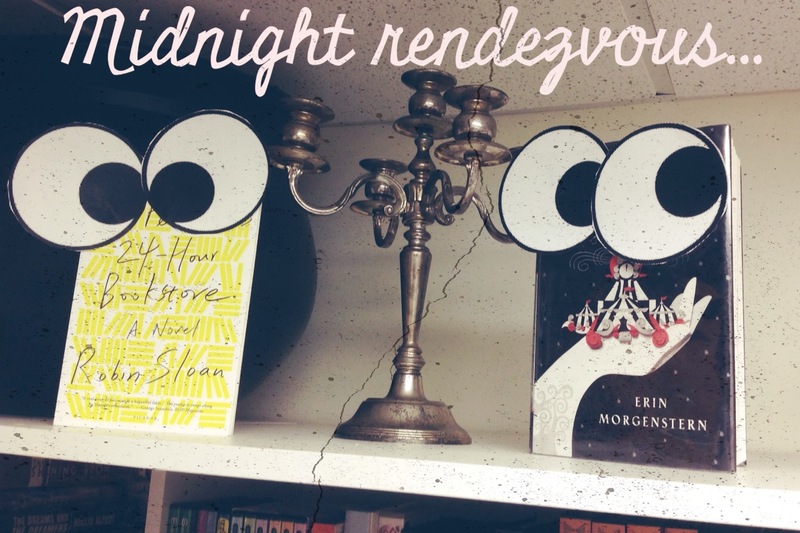 Here are Mr. Penumbra’s 24-Hour Bookstore and The Night Circus hanging out. Some of our high schoolers or parents might enjoy these books. Both books won Alex Awards, given to adult books that have great appeal to young adult readers. Who wouldn’t want to go to The Night Circus where attractions include the beautiful Ice Garden or a room filled with clouds that you can jump from one to the next? No clowns or sad animals here. But behind the scenes the two magicians behind these illusions are unaware that they are part of a dangerous game that their masters created years before. Mr. Penumbra’s 24-Hour Bookstore is about a web designer down on his luck and working in a 24-hour bookstore where many of the eccentric customers don’t buy books; they check them out. When Clay decides to use his computer skills to map out their behavior and book choices, he makes some discoveries that surprise him. Some of us in the teachers’ book club got to Skype with the author who also happens to be a friend of former physics teacher, Mr. McLeran. A couple books staying up past their bedtimes. 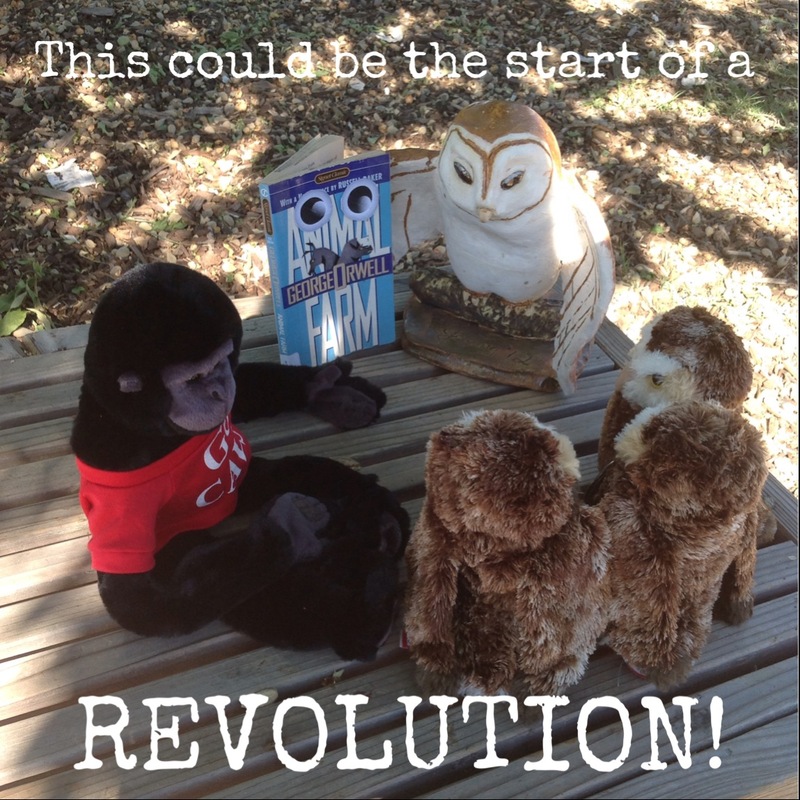 It looks like library copy of Animal Farm found some recruits in the garden! What is their plan? To take over the world? Are those the 50th anniversary owls? And why does the Cavalier monkey look so perplexed? Uh-oh, did those books get into the library fines? That’s The Westing Game, one of our favorite books. If you didn’t read this before starting middle school, you should read it, especially if you like mysteries. Millionaire Sam Westing brings together 16 people for the reading of his will. Whoever figures out who killed Sam inherits his money. It’s a fun mystery with great characters who will make you laugh. Good thing we like this book so much, or he’d be in trouble for robbing us blind. Actually we know he’s a solid book; we’re sure he’ll return the money after he’s done playing. 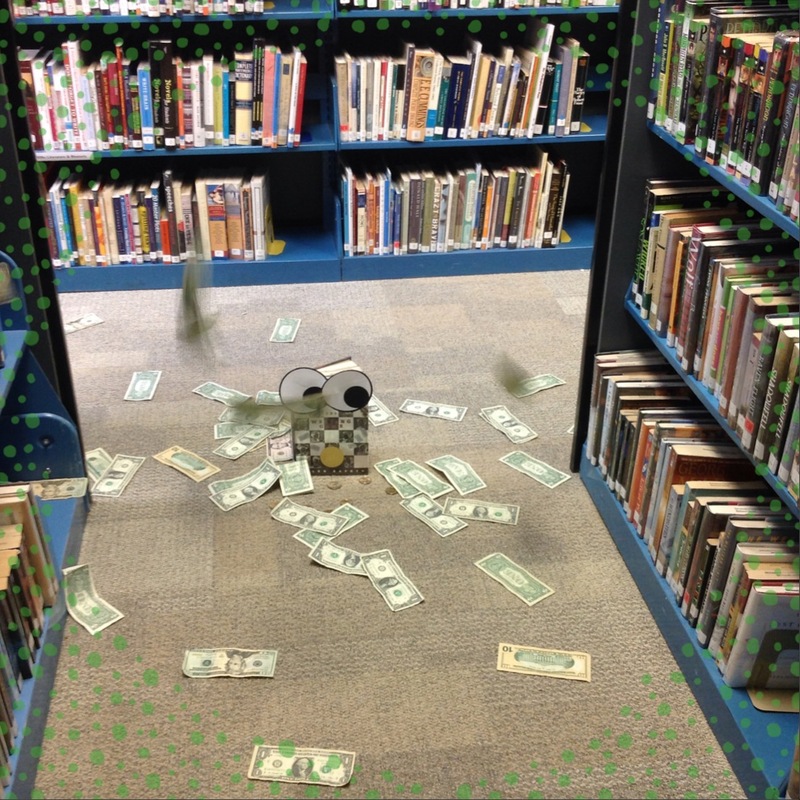 The Westing Game making it rain in the library stacks.